Microsoft engineer Dan Luu looks into computer keyboard latency / input lag in his latest tech blog post (via HardOCP). Spurred on by a feeling that modern computers "feel slower than the computers I used as a kid", Mr Luu published some surprising findings. His conclusion is that "almost every computer and mobile device that people buy today is slower than common models of computers from the 70s and 80s," in input latency terms. 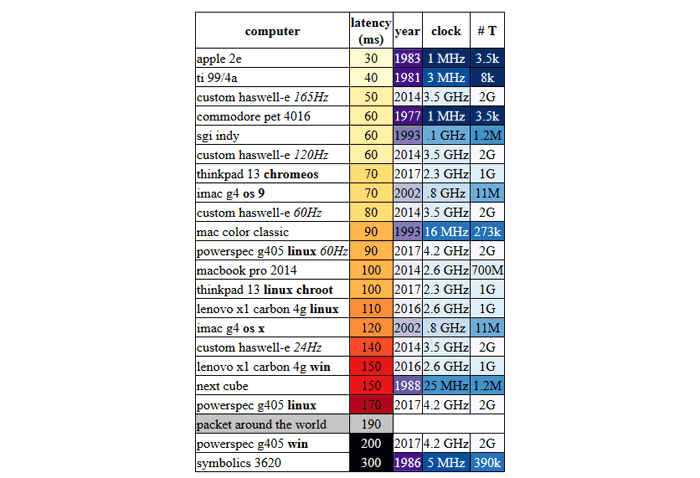 Luu's hunch that modern devices exhibit considerable input latency looks to be true. In the chart above you can see computers from 1977 to the present day ranked by measured input latency in milliseconds. Please note that the background colour in other cells gets darker and purple-er as devices get older, and when devices are tested with multiple OSes the OS is listed in bold type. There's another variable - in italics you can see various monitor refresh rates tested and their impact tabulated. Luu measured the input latency between a keypress and the display of a character in a terminal using multiple runs, using a high speed camera (up to 1000fps = 1ms resolution). As Luu reports, "the fastest machines are ancient". However, PC modern gaming machines with fast refresh rate monitors attached can be competitive. Another interesting entry in the table is the reference latency of a fibre packet transmission from NYC back to NYC via Tokyo and London (190ms). 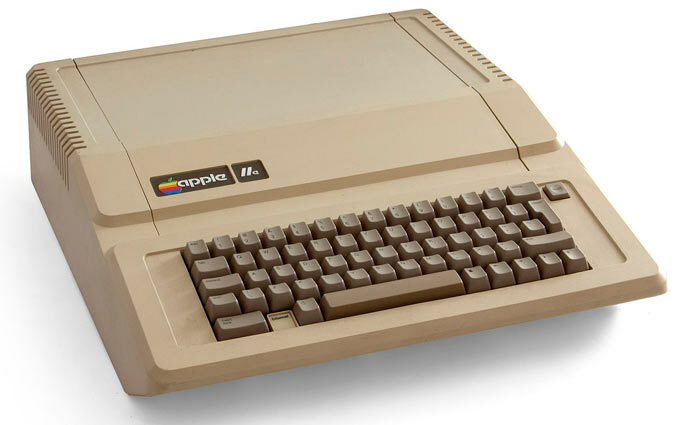 Computers like the Apple 2e are so fast due to advantages in both the input and output, asserts Luu. Considering input first, the Apple 2e effectively scans at 556Hz, while modern keyboards scan inputs typically in the range from 100 to 200Hz. 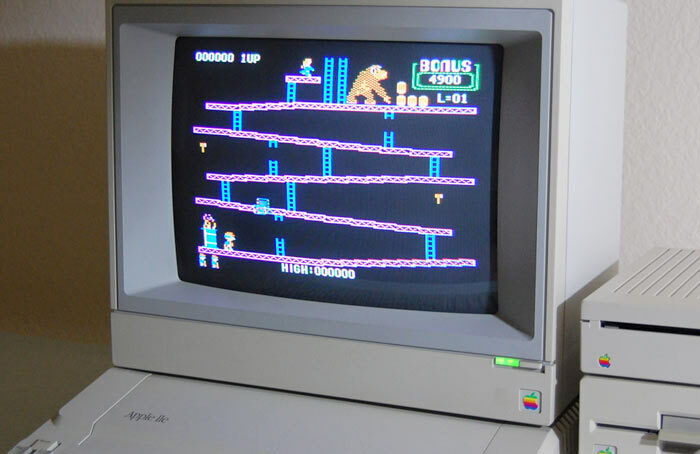 At the other end of the chain of events, a CRT connected to the Apple 2e will exhibit an 8.3ms latency, while a modern 144Hz display will deliver an expected total latency of 13.5ms, according to Luu's findings and calculations. Another significant advantage of keyboards of the Apple 2e and similar era is that they use dedicated logic for the keyboard as opposed to a general purpose processor based system which affords customisations etc. Luu refers to this introduction of complexity for convenience as 'accidental complexity'. All this computing complexity adds significant overhead and impacts on performance as noted above. Luu's conclusion is that it is "a bit absurd that a modern gaming machine running at 4,000x the speed of an Apple 2, with a CPU that has 500,000x as many transistors (with a GPU that has 2,000,000x as many transistors) can maybe manage the same latency as an Apple 2 in very carefully coded applications if we have a monitor with nearly 3x the refresh rate". But on a positive note he sees us "emerging from the latency dark ages and it’s now possible to assemble a computer or buy a tablet with latency that’s in the same range as you could get off-the-shelf in the 70s and 80s". If you are interested Luu also looks into the input latency of smartphones and tablets in his extensive blog post. Luu measured the input latency between a keypress and the display of a character in a terminal using multiple runs, using a high speed camera (up to 1000fps = 1ms resolution). i loved my acorn electron when I was little and that was before game pads and mouse's ish . Has anybody in the history of anything actually found this to be a problem? Actually, don't answer that, I really don't care. This comment section today is filled with such ignorance. How would you measure latency across all these decades old systems to modern day computers using CS:GO, or other games reliably. That doesn't make sense. The approach given is fine although not perfectly accurate. With multiple runs and rounding to the nearest 10ms for end to end latency it is repeatedly reliable though.